For Violet, family is the most important thing in the whole galaxy. So when her father goes missing while on a hazardous job, she can't just sit around and do nothing. Throwing caution to the stars, she sets out with a group of misfit friends on a quest to find him. But space is a big and dangerous place for a young girl, and when she discovers that her dad has been swallowed into the belly of a giant planet-eating whale, the odds looked stacked against them...Visionary graphic novel creator Craig Thompson brings all of his wit, warmth, and humour to create a brilliantly drawn story for all ages. 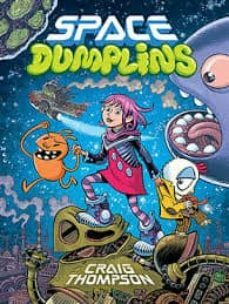 Set in a distant yet familiar future, Space Dumplins weaves themes of family, friendship, and loyalty into a grand space adventure filled with quirky aliens, awesome space-ships, and sharp commentary on our environmentally challenged world.